Looking for unique bridal, birthday or bachelorette party ideas? Planning your special event- whether it’s a birthday, bachelorette party or bridal shower can be challenging. And, if you are anything like us, you are the one always organizing get-togethers for your friends and you like it to be good. Why not invite your friends to something a little different – paint and wine. Of all the birthday, bridal shower or bachelorette party ideas- your group will be impressed- we promise- with our semi or fully private event venue that provides everything you need for an unforgettable event. Wine, Food & Art combine three of life’s greatest pleasures in one place. There’s NO Painting experience required AND we clean up the mess. We think it’s the perfect way to celebrate. Show Up & Have Fun! 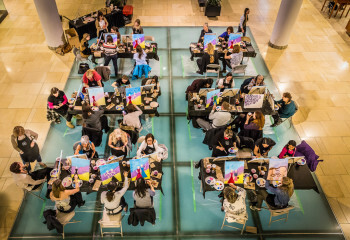 In addition to providing you with the hottest birthday, bridal shower or bachelorette party ideas in Calgary- our evening paint & sip sessions are great for Date Night, Anniversaries or Girls Night out. We also host children’s parties! Parties are two to three hours long. Cost starting at $300; Starting at $30 per child. 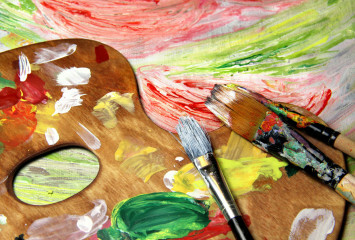 Painting parties include all painting supplies, & instruction, Cheese pizza and Juice available at an additional cost. We also host children’s cooking parties. Parents are welcome to join the party or have a bite to eat and a drink while waiting. We have a fabulous food and drink menu.